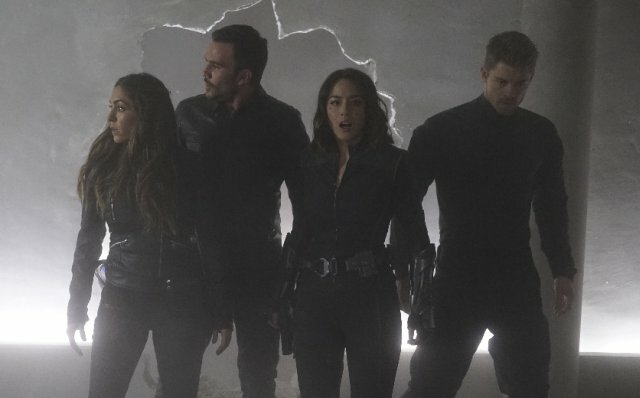 Home » Agents of S.H.I.E.L.D., “The Team”, Review! Agents of S.H.I.E.L.D., “The Team”, Review! In last week’s episode of Agents of S.H.I.E.L.D., Giyera (the Inhuman with telekinetic powers) brought down the Zephyr (S.H.I.E.L.D.’s plane) into Hydra’s base. May was able to alert Daisy just before Hydra attacked. So in this episode Daisy assembles the Secret Warriors, which consist of Lincoln Campbell, Elena ‘Yo-Yo’ Rodriguez, Joey Gutierrez, and Daisy Johnson herself. Together they attack the Hydra base and rescue the team. In the process, Joey kills Lucio (the Inhuman with the ability to paralyze with a look) and Lincoln captures Malick. There’s some more flirting between Yo-Yo and Mack, adding to the chemistry we saw back when Yo-Yo first appeared on the show, it’s also clear that Joey is having a lot of remorse after killing Lucio. Coulson interrogates Malick, trying to get information on Hydra and the alien parasite ‘Hive’. After Coulson insists that it’s not a god, Malick retorts, “Oh Coulson, it’s a god. Just not ours.” Malick reveals that Hive is able to infect other Inhumans, controlling them. 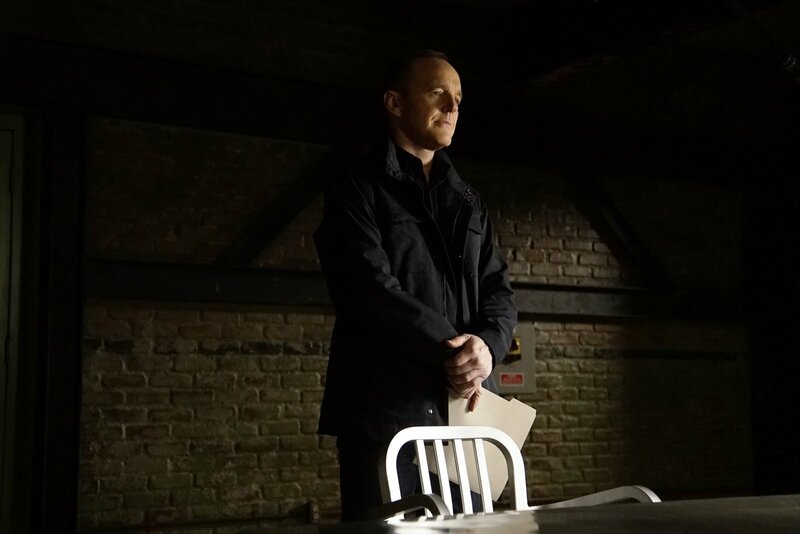 He tells Coulson that one, if not all of the Secret Warriors have been infected. Coulson shuts down that base and the Inhumans are automatically suspicious. After FitzSimmons discover that the parasite had infected Lucio, Coulson begins to try and find a way to ice the Secret Warriors until they can find a cure. Shortly after, the power goes out and Malick is killed. A grenade goes off beside the body concealing the cause of death. Coulson and the team try to round up the Secret Warriors with no success, but reveals that they might be infected. After the Warriors find this out, they begin to argue over which one of them is infected, in the end they decide to try and sneak out rather than fighting. Daisy tricks them into containment cells, where they begin a theory that Lincoln has been infected since he first met Hive. Later, we find Daisy is actually the one infected. Before things go insane, we find FitzSimmons trying to figure out how to test for and cure the infection, and they kiss. It appears we are finally getting a permanent relationship as Fitz says, “Who needs space, ’cause I’ve got something magnificent right here.” Naturally, he ruins the moment by insisting it’s a poster on his wall, and Simmons kisses him to shut him up. We couldn’t have that happy of an ending as Hive! Daisy breaks the locks out of the base and starts destroying it with her powers. I cannot say how much I loved this episode. This easily could have been the season finale, and I don’t think AoS has had this strong of an episode since ‘Turn, Turn, Turn’ back in season one. First off the fight scenes were fantastic. You can see where each member of the group has improved in controlling their powers and perfecting their hand-to-hand combat. Also, the special effects for Daisy and Lincoln’s powers in particular are great. I feel for how serious this episode is, it had some well timed comedy. I think one of AoS’ major problems is that it can occasionally forget to be a funny, quirky show, alongside with its more serious aspects. Also, I love this idea of Daisy going rogue. She is easily S.H.I.E.L.D.’s most powerful asset, and it is going to be a true challenge to combat her. It’s easily going to be an emotional challenge as well, as almost the entire team has a strong relationship with her. Speaking of relationships (sorry for the all caps but,) FITZSIMMONS ARE FINALLY TOGETHER!!! It finally happened! I really hope this is something they stick with and don’t end it for a stupid reason after a couple of episodes. I am literally bouncing off the walls excited to see where this is going to go. Finally, it was really great to see Coulson conflicted about Ward and his motives, thinking about why he killed him and the consequences. The greatest thing about Coulson both as a character and leader is that he is very human. For how strong a decisive he is, he is also can be emotional and vulnerable. As for if there was anything wrong with this episode, I think that all lies in the follow-up. How they handle Daisy going rogue and FitzSimmons as a couple. I can’t wait for next week. Five out of Five.